Give a roar in our latest T-Rex Inflatable Dinosaur Costume - now with sound! This adult dinosaur costume is a viral sensation you can wear for fun or Halloween. Now with Roaring T-Rex Sound!! This adult dinosaur costume is a viral video star! For Halloween or to make your own fun cosplay videos, this adult t-rex costume is amazing! Costume includes an action packed full-body inflatable jumpsuit, excellent orange and brown multicolor detailing, with white scratch marks to show the most gruesome of fights! Signature yellow eyes and piercing white teeth, completes the look of this carnivorous creature! 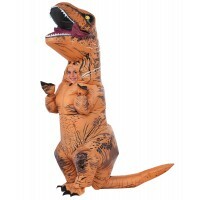 Our very popular costume now includes a roaring T-Rex sound!!! Inflatable costume has a built in hood with drawstring for easy fit, and is placed comfortably under the dinosaur head in neck area. Costume includes a zipper closure for easy in-and-out. Costume also includes a battery operated fan pack, and gloves. Costume requires 4"AA" batteries (not included). Easy assembly required. Adult standard size one size fits most teens and adults up to size 44. 100% Polyester. Care instructions: wipe clean with damp cloth, line dry, do not wash, do not bleach, do not iron and do not dry clean. Item Number: M/RB-820679 | Approximate Size (Inches): 12.00 wide x 4.00 deep x 16.00 high | Approximate Shipping Weight: 2.00 lbs.